Audrey Diaz is an Academy senior, a third-year journalist, and Editor-in-chief for Achona. Although she is slightly nervous for the pressures that accompany her position, she is confident in having support from her fellow editors. She has a passion for organization and planning as she feels it keeps her life in place, and loves any chance she can use it to help others. As a senior, Audrey is most excited about cherishing her year of “lasts”, and taking everything that Academy has taught her and applying it to her future. In school, Audrey is an Academy Ambassador, a cast member in the annual musical, and a member of Beta, English and Quill & Scroll National Honors Societies. Her favorite subject is AP Human Geography because it teaches her about the way the world works and the reasonings behind it. 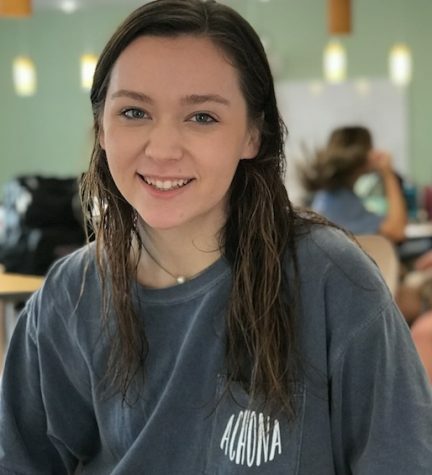 When not at practice for the Jaguarettes Dance Team, Audrey can be found watching "Scandal", researching conspiracy theories and crime scene investigations, drinking green tea, watching Corgi videos, or cuddling with her rescue chihuahua, Remi. She is weirdly good at remembering middle names, and peanut butter is her favorite “food group.” After graduating from college as a communications major, Audrey is interested in becoming a public relations specialist with a focus on crisis management for a government or entertainment corporation. In her future career, she hopes to find creative ways to help foster the relationships between her clients and the media.